Here at Haute Apple Pie we are celebrating our two year anniversary (or as we like to call it, blogversary)! We can hardly believe it has been two full years since our idea came into fruition. Thank you to all of our loyal readers for listening to what we have to share! Two years seems like a mere grain of sugar in a hot pie compared to the 100 year anniversary local Wisconsin company West Bend Housewares is celebrating this month. 100 years in business is quite a remarkable accomplishment this day and age, so we tip our chef’s hats to them! We are very excited to tell you that we are sharing the spirit of celebration by giving away a West Bend Versatility Slow Cooker this week! We can’t say enough about how great this slow cooker is, especially if space is limited in your kitchen. Not only is it a slow cooker, but it is a griddle and a warming tray as well. It has four temperature settings and the vessel can be used on the stove top, oven, refrigerator and freezer and it is dishwasher safe! We know many of our readers are avid slow cooking fans, so we are excited that one of you will be the lucky winner of this little beauty! To enter our giveaway, leave a comment telling us about your favorite meal to make in a slow cooker. You can also get a bonus vote by going over to Facebook and “liking” West Bend. Leave us a comment to tell us you did so! The giveaway ends at midnight (Central Time) on Thursday, September 22, 2011. The winner will be announced Friday, September 23rd. Congrats again to West Bend for 100 years! You must be 18 years of age and a citizen of the United States to enter. No purchase necessary. The winner will be chosen at random. Favorite think to cook in my slow cooker is my Rosemary Chicken!! I also went to the West Bend page and gave then a thumbs up. Man is that stuff good! My favorite slow cooker meal is white chicken chili. I’ve also “liked” the facebook page as well. Oh, so many things I love… a nice venison roast; a nice, rich beef stew; ham and beans….. I love it all! Nice giveaway, thanks for the opportunity! Favorite slow cooker meal… hard to decide. But I would say apricot chicken because of just how simple it is to make. I’ve also “liked” the facebook page as well. My favorite slow cooker meal is a toss up between pot roast, or shredded pork for tacos. Yummy to both! My mom’s easiest stew in the world… and this year with Elk! Potroast or Homemade Yogurt! And I love to warm simmering cider in it!! What a fantastic giveaway! My favorite slow-cooker recipe is Beer Braised Corned Beef. It’s super easy and the family just loves it. I am hoping to try out some new slow-cooker recipes this fall! My favorite thing to cook in a slow cooker is spiral ham! Cooked on low for 3-6 hours and basted with a honey/butter/brown sugar mixture regularly. Tastes incredible! What a great giveaway from my hometown — West Bend, Wisconsin! 🙂 My favorite thing to cook in the crockpot is shredded beef. I find my crockpot too big and cumbersome, though and I often don’t pull it out since it was hard to find it space in the kitchen in the first place! This one looks much easier to use. And are we serious about the griddle as well on this one… and a roasting rack!?! Awesome. I’ve always liked West Bend, but I just made it official on Facebook! I love making slow cooked pulled pork sandwiches for my family on a cold afternoon! I put two pork tenderloins in the slow cooker and cover with vidalia onions and BBQ sauce. Simple and delicious! I use my slow cooker almost every day – I am a working mom – and it is wonderful to have dinner ready when I get home from a long day! Favorite thing to cook is tex mex chicken….easy and yummy!! I love making pulled pork in the slow cooker. What a great give-away! Thank you! It’s so simple, but I love cooking a whole chicken in the crockpot with yummy veggies. It is just perfection! My favorite is Italian Beef. Nothing like combining the beef, onions and peppers and smelling the delicious fragrance. Crockpot does it to absolute perfection and is a crowd pleaser every time I make it. Will respond to West Bend – love their products and nice to support a West Bend industry. I have a great veggie lasagna slow cooker recipe. I truly believe the slow cooker brings out the best flavors in fresh vegetables! My favorite thing to cook is turkey and gravy for sandwiches. Delish!! I would have to stay that my favorite slow cooker meal is the old standard pot roast. It just makes the house smell so good. I love your blog!! You have great ideas for parties and yummy food. Katie and I went to high school together, it is fun to see what you come up with. So creative! My favorite slow cooker meal is pulled/shredded chicken. Chicken plus any sauce, our favorite is BBQ, and dinner is done. My slow cookers inside has seen better days, it would be cool to win this. Any kind of soup or chili is great in the slow cooker. My favorite easy meal is salsa chicken. I like West Bend on Facebook. My favorite meal to make in my slow cooker is pork and saurkraut but I also like to use it for shredded chicken, sloppy joes, bbq pulled pork and soups. I am also in the process of collecting recipes to make side dished and desserts in it as well. Thanks for the chance to win one. I make black beans in my crockpot and serve them with rice. Easiest, most nutritious meal I make! and it’s meat-free! Apple Cobbler is our favorite slow cook dessert! My favorite thing to make in the slow cooker is baked beans. Nice giveaway! Great Grandma’s stew beef for sure! Almost forgot! Happy blogiversary! I like West Bend on Facebook. Even though it’s hard to pick a favorite, my favorite thing to make in the slow cooker is BBQ Shredded Beef! please please please please 🙂 with a cherry on top ! Beef Bourgonon. The aromas just take over the house. Congratulations on your 2 year blogiversary! My favorite thing to cook up in the crock pot is sweet potato chili, a recipe I found in the Milwaukee Journal last fall. it’s a toss up… I like to make pulled pork, many soups, or stew in my slow cooker. Last year at Thanksgiving I tried making the stuffing in the slow cooker due to lack of oven space and it turned out great… nice and moist! My fav thing to cook in my slow cooker is beef tips with mushrooms and gravy! My fave slow cooker meal is Thai Chicken a variation we make of it from allrecipes.com. Although I will totally miss summer, I am excited for slow cooker and soup season! My favorite thing to make in my slow cooker is soup. We love soup in the fall and winter and since it’s rapidly approaching here in the North, I’m ready to pull it out again and get cooking. I already “like” West Bend on Facebook. I also recently made enchiladas which came out really good. I highly recommend Stephanie O’Dea’s Make It Fast, Cook It Slow cookbook. Awesome. I like cooking Paula Dean’s Taco Soup. I would fix Applesauce in my slow cooker as it tastes wonderful this time of year! A thumbs up to West Bend Also! I’ve actually never made a slow cooked meal but hear the soups, enchiladas, and stews are wonderful! Happy 2nd blogoversary! I “like” West Bend on Fb! My favorite recipe to make in a slow cooker is Asian Pork. Pot roast is my favorite! The house smells great and it’s so easy. I also like BBQ beef for sandwiches (using a pot roast). Happy Anniversary! I love making taco soup, Italian chicken and shredded beef in a slow cooker. My favorite meal to make in a slow cooker is roast beef with potatoes, carrots, and onions. Pot Roast – not the most exciting, but it is soooo easy and the husband thinks it’s genuis! Good old Pot Roast with veggies…love how it’s so tender, moist and falls off the bones. So happy Fall is here to make more comfort food! My favorite thing to make in the slow cooker is baked potatoes. I’m rarely home long enough to make them in the oven so the slow cooker is the next best option. Congratulations Ladies! It’s been fun following you 🙂 My favorite thing to cook in my mom’s slow cooker is a spinach queso dip that is great for Packer Parties (Go Pack!). 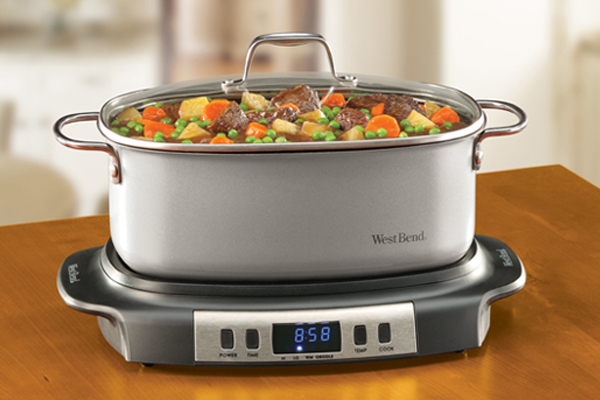 I just “liked” West Bend on FB, thanks for the opportunity to win my very own new slow cooker! I love making this beef pot roast stew stuff I threw in the crock pot one day! I love when you throw things in and they turn into an amazing and continue to use recipe! I liked them on fb too! I love making stew in my very old crock-pot. This is a beautiful crock-pot and I love the versatility and what would be super easy cleanup. I am and have been a fan of West Bend. I make LOTS of things in my slow cooker…mostly fruit butters lately but will do lots of soups, stews, and chilis as winter comes to visit! I love making pork loins! The slow cooker makes them so tender and juicy! My favorite slow cooker recipe is Italian Chicken with potatoes! My favorite slow cooker recipe is apple chicken stew made with fresh apple cider. So many good orchards here in Wisconsin! My family loves the slow cooker stew that I make throughout the fall and winter months. I like it too because it is soooo easy to fill-up the crock-pot and let it do the work! I’d have to go with the ham and potatoes dish my mom would always make in the winter when I was a kid. Since I live in a studio apartment, a slow cooker would be a great addition of versatility to my little kitchen! My favorite thing to make in a slow cooker is my grandmother’s Irish Lamb Stew. Liked on Facebook too! My favorite crock pot recipe is Chicken Taco Chili! I found the recipe on the Skinnytaste blog 🙂 I also “liked” West Bend. I love to slow cook, and have a small kitchen! I would LOVE this prize!!!!! I liked West Bend on Facebook! Favorite slow cooker meal is beef/venison stew. as a recent vegetarian (about 3 years now) i just about freaked out when i discovered how to make beans in the slow cooker.